Stephanie graduated from the University of New Hampshire in 2016 with Bachelor degrees in both Exercise Science and Psychology. 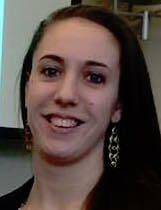 While at UNH, she also received a minor in Nutrition and was a five-year member of UNH's Division 1 basketball team. Stephanie joined the STAR team in September of 2016 and is in the process of receiving her CSCS certification. Her career interests include functional fitness training, sports performance, fitness and nutritional assessments, and nutritional counseling.